Storage Systems makes looking your best easy. 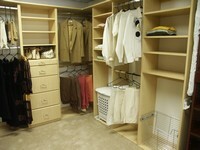 Organized closet systems keep your clothes looking neater. They no longer get those creases caused by crowding everything on a single rod.Separated clothing spaces also make garments more visible.You'll be able to match at-a-glance individual pieces and confidently coordinate your attire. You may find new clothingcombinations to expand your dressing options. And when your clothing styles change, so can your closet. Adjust the shelves, add rods, drawers, baskets, any of our available accessories to change your closet as easily as your wardrobe. Storage Systems is perfect for children, too. Rods, shelving and drawers can be positioned to put toys and clothes within their reach. Think of Storage Systems for every room in your home. These attractive closets can be configured to accommodate collectibles, books, dishware, stereos-whatever and wherever you want an organized space. Precision construction, quality materials and versatility are built into every Storage Space closet system. Choose from any of our popular configurations or let us help you design systems to meet your unique needs. Storage Systems closet systems are constructed of three-quarter inch melamine laminate. They're durable and clean easily with any non-abrasive household cleaner.